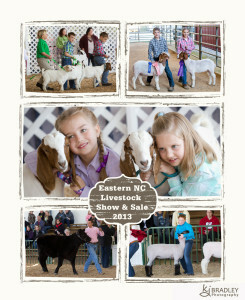 I married a farm boy and as the mother of two 4-H’rs, I have come to look forward to the annual Eastern North Carolina Livestock Show and Sale for Edgecombe, Halifax, and Nash Counties. Over the years, the event has become a tradition. My boys enjoy the 4-H experience and have had livestock projects since they were old enough to hold a rope. This year’s youth did a great job as always showing their animals. Many thanks to the NC Cooperative Extension Service agents, parents, buyers, and volunteers who donated their time and money to support this wonderful leadership experience for 4-H this year. Snapshots from many of the shows are available here http://www.kjbradleyphoto.com/4hshow2013. Contact your local 4-H agent for the download password if you need a specific image for your future presentations.